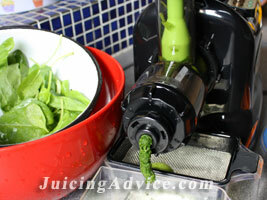 Juicing recipes are so easy to follow and simple to produce that you really can’t go wrong. The main thing that I would advise before you start to follow any of the recipes make sure that you have the right equipment. 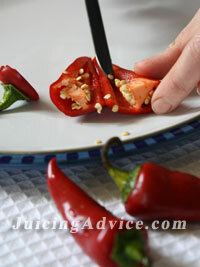 If you only have a hand held or citrus juicer then just follow the citrus fruit recipes. If you have a centrifugal juicer you can normally follow most recipes with the exception of weatgrass recipes if your juicer is not suitable for this. Most masticating or gear juicers will normally juice everything including weatgrass. Just check your instruction book manual before starting a new recipe. When you start juicing you are more than likely going to want to follow recipes, as this is the easiest way to achieve success. Here are a few of my favourite free juicing recipes to get you started. By following recipes you will also quickly learn which fruit and vegetable combinations work well and some idea of the quantities you need. You can download plenty of juicing recipes from the web, make sure you also visit my healthy recipes and vegetable juice recipes pages. You may also want to think about buying a recipe book. Before you splash your cash and purchase a book just make sure that it’s full of recipes that suit your particular juicer or indeed are proper juice recipes. Some books claim to have recipes for juicer then as you flick through the pages three quarters of them are made in a blender and are in actual fact smoothies. Not that I’ve got anything against smoothies it’s just if you want juicing recipes then that’s what you expect to get. The great thing about juicing recipes is like any recipes you can adapt and develop them and even invent your own. Sometimes juicing is just about making up recipes with the things that you’ve got readily available to you. Don’t be afraid to have a go the worse that can happen is your drink doesn’t taste quite as good as it should. Juicing recipes are not only confined to the drink variety have a look at some of our juicing pulp recipes. If you’re anything like me I hate wasting any food and these recipes and ideas will give you some great ideas of what to do with your pulp waste. 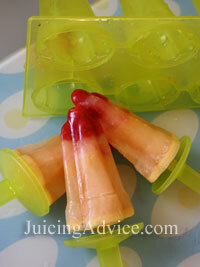 One of my favourite things at the moment is making fruit lollies. This is probably because we are experiencing a heat wave here and I’m in need of something to cool me down. But seriously it’s so easy, don’t go buying those supermarket lollipops that are full of additives and preservatives simply make your own. All you need is a lollipop mould and a freezer. I love pouring juice into the mould in stages then freezing it and adding a bit more etc. then you get the lovely multi flavoured stripy lollipop you can see here. They really do taste so much better than the commercially bought ones and you know that only pure fruit juice has gone into them.